This Persistence Market Research (PMR) report examines the rheumatoid arthritis market performance in terms of value and volume contribution. 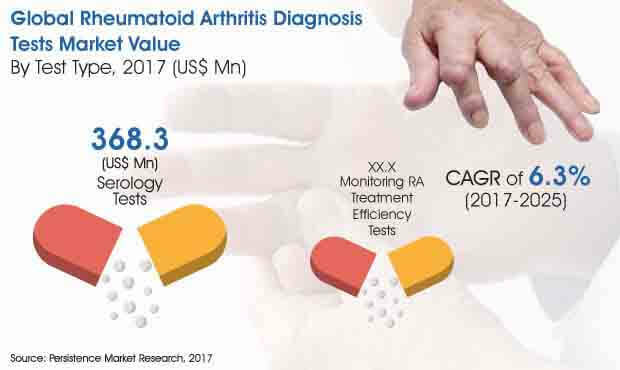 The report includes key trends, drivers, restraints, and opportunities influencing growth of the global rheumatoid arthritis market over forecast period (2016–2027). Impact analysis of key growth drivers and restraints based on the weighted average model are included in this report to better equip clients with crystal clear decision-making insights. Various types of kits used to ascertain amount of substance in samples across hospitals, diagnostic laboratories, ambulatory surgical centers have been considered in this report. This report covers the global rheumatoid arthritis diagnosis tests market performance in terms of revenue contribution from various segments. This section also includes PMR analysis of key trends, drivers, restraints, and opportunities, which are influencing the growth of the global rheumatoid arthritis diagnosis tests market. The global rheumatoid arthritis diagnosis tests market report begins with an overview of the global rheumatoid arthritis diagnosis tests market. This section also underlines factors influencing growth of the global rheumatoid arthritis diagnosis tests market along with detailing of the key trends, drivers, restraints, opportunity and regulations. Impact analysis of key regional growth drivers and restraints based on the weighted average model along with key region-specific trends is included in report to better equip clients with information and hidden insights. The global rheumatoid arthritis diagnosis tests market is segmented on the basis of test type, end user and region. By test type, the global rheumatoid arthritis diagnosis tests market is segmented into serology test and monitoring RA treatment efficiency monitoring tests. Serology test segment is further sub-segmented into erythrocyte sedimentation rate (ESR), rheumatoid factor (RF), anti-cyclic citrullinated peptide (anti-CCP), antinuclear antibody (ANA), uric acid test, and other tests. RA treatment efficiency monitoring tests segment is further sub-segmented into Salicylate Level Count, Muscle Enzyme Tests (CPK, Aldolase), and Creatinine Test. A detailed analysis has been provided for every segment in terms of market size, Y-o-Y growth rate, absolute $ opportunity, market attractive index. By end user, the global rheumatoid arthritis diagnosis tests market is segmented into hospital, diagnostic laboratories, and ambulatory surgical centers. Diagnostic laboratory segment is further sub-segmented into private laboratories and public laboratories. The next section of the report highlights the growth trends of the rheumatoid arthritis diagnosis tests market by region. It provides a market outlook for 2012–2027 and sets the forecast within the context of the rheumatoid arthritis diagnosis tests market. The study discusses key regional trends contributing to growth of the rheumatoid arthritis diagnosis tests market worldwide, as well as analyses the extent to which drivers are influencing this market in each region. Key regions assessed in this report include North America, Latin America, Europe, Asia Pacific and MEA. APAC region is expected to emerge dominant and most attractive over the forecast period. The above sections – test type, end user and region – evaluate the present scenario and growth prospects of the rheumatoid arthritis diagnosis tests market for the period 2012–2027. We have considered 2016 as the base year and provided data for the forecast period. The final chapter in the report covers analysis on key competitors involved in this market. Detailed company profiles include company-specific long-term and short-term strategies, key offerings and recent developments in the rheumatoid arthritis diagnosis tests market. Rheumatoid arthritis (RA) is an autoimmune or destructive joint disease that causes the body’s immune system to attack joint tissues, which leads to loosening joint ligaments. The deformity of joint ligaments caused by inflammation in the tissues that produces lubrication fluid for them. Such inflammation of joint lining or distortion causes pain, stiffness, swelling, warmth, and redness. Rheumatoid arthritis is most prevalent among women. RA can be diagnosed through two methods, namely blood tests/serology test or monitoring RA treatment efficiency tests. The serology tests include blood test such as erythrocyte sedimentation rate (ESR) test, rheumatoid factor (RF), C-reactive protein (CRP) which helps to indicate the presence of inflammatory process in body, anti-CCP antibodies etc. Some imaging tests are also perform such as X-ray imaging tests. Global rheumatoid arthritis diagnosis tests market has been estimated to be valued at US$ 514.0 Mn in 2016, and is anticipated to increase to US$ 1,002.0 Mn by 2027, registering a CAGR of 6.3% during the forecast period. Incidence of RA are increasing among children in APAC and Europe. This increased incidence rate calls for adoption of minimally-invasive test methods to diagnose rheumatoid arthritis. Hence, there is high demand for RA test kits with minimally-invasive testing method in Europe and APAC region. The serology tests segment in the product type category is estimated to reach a value of more than US$ 690 Mn by the end of the year of assessment from a valuation of around US$ 365 Mn in 2017. This segment is projected to grow at a value CAGR of 6.5% throughout the period of assessment. Serology tests are expected to largely contribute to the growth of the global market for rheumatoid arthritis diagnosis tests. The serology tests segment is expected to witness growing adoption by several end users such as hospitals, ambulatory surgical centers and diagnostic laboratories in the coming years. Serology tests segment is categorized into Erythrocyte sedimentation rate (ESR), Rheumatoid Factor (RF), Anti-cyclic Citrullinated Peptide (anti-CCP), Antinuclear Antibody (ANA), uric acid and other tests. Of these, the Anti-cyclic Citrullinated Peptide (anti-CCP) tests sub segment is estimated to reach a valuation of more than US$ 235 Mn by the end of the year of assessment (2025) from a value of about US$ 115 Mn in 2017, thus largely contributing to the growth of the serology tests segment. The Anti-cyclic Citrullinated Peptide (anti-CCP) tests sub segment is projected to grow at a high value CAGR of 7.5% throughout the period of assessment. On the other hand, the Antinuclear Antibody (ANA) sub segment is projected to grow at a steady pace to reach a significant market valuation by 2025 end. This sub segment is the third largest in the serology tests category. Other tests segment is the lowest with respect to market valuation and growth rate. Monitoring RA treatment efficiency tests segment is estimated to reach a valuation of more than US$ 300 Mn by the end of the year of assessment and is projected to grow at a value CAGR of 5.8% throughout the period of assessment. This test type has been witnessing a relatively slow adoption as compared to serology tests.